Four valuable books 3 in Tamil and the one in English were released on the occasion of Dual Conference of DK at Thanjavur. 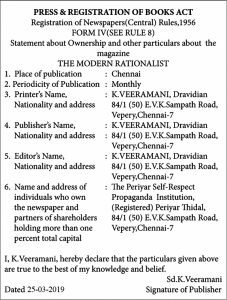 The first one is ‘Suyamariyathai Iyakkam Orr Amaithi Puratchiye’ (Self Respect Movement, a silent revolution). 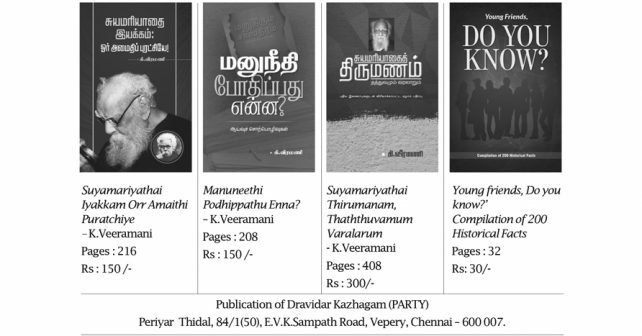 Authored by Asiriyar Dr. K.Veeramani, it shows how Self Respect Movement, started by Thanthai Periyar brought about a silent revolution in the thinking of the people. The opening chapter reveals the inhuman and uncivilized condition that prevailed before the advent of the Movement. Brahmins, who occupied the topmost rung, were so much venerated that drinking the water with which their feet was washed was considered to be auspicious and beneficial. On the other hand, those who occupied the bottom rung were excommunicated in spite of their being of the utmost service for the community. Justice Party which came into being in 1916 started setting right such anomalies. Yet, it was only after Periyar stormed into the socio – political scene that the movement got a new impetus. He founded, ‘Self Respect Movement’ which put the problem in the right perspective and called upon the depressed lot to agitate. The work goes into the different aspects of the Movement, including its efforts to bring the women subjugation to end, and the fight for temple entry for all Hindus. The specialty of the work is that it allows the documents to speak, citing a number of them, the author keeping himself in the wings. It presents a precise idea of the virulent campaign that made the revolution possible. An appendix bears out that as many as 167 conferences were held in a short span of 22 years. The next work, ‘Manuneethi Pothipathu Enna?’ (What does Manusmriti advocate?) is a scientific dissection of Manusmriti a monstrosity that was once presented as morality. It is a compilation of three lectures delivered in 2018, as a warning to the South Indian public against the sinister behind – the – back attempts made by the Hindutva elements to enthrone Manuadharma. Quoting from Dr. Babasaheb B.R. Ambedkar’s works, Asiriyar K.Veeramani shows how the history of India has been warfare between the Buddhists and Brahmins and how the vital fact has been slurred over by the historians. The purpose of Manuadharma had been establishing permanent superiority over the others, quoting religious injunctions in support. Every effort was made to denigrate the Sudras an accursed race who were not entitled to any property or even any recognition. Further, there is no unanimous opinion as to how the four Varnas came into being even among the Brahmins, showing that the very concept is murky. Only one thing an observer can be sure of is that every caste had been trying with the rest to establish its own inferiority. All this can show only one thing: Caste was the section of selfish elements’ benefit of logical thinking. The author quotes from various scriptures of Hindu religion and shows how none of them stands for equality and how diametrically opposed are they to all the philosophy of equality preached by Tiruvalluvar, whose Tirukural emphasizes equality of all human beings. The third release Asiriyar K.Veeramani’s Tamil work ‘Suyamariyathai Thirumanam, Thathuvamum Varalarum’ (Self Respect Marriage – Concept and History) is a comprehensive work on the topic covering the origin, and the development of Self Respect Marriage which has been in vogue in Tamil Nadu for almost a century. When Periyar entered public life, he started shaking all institutions which were held sacred. Marriage being the most important milestone in a person’s life, it naturally received utmost attention from him, who dissected the ceremony into three parts, the part which infringed upon a woman’s self respect, that part which was superstitious and superfluous and the part which was the core of wedlock. Wedding being a sacrament in Hinduism, divorce is unthinkable and the slavery of woman in irrevocable. A lot of rituals are there to reinforce the inferiority of the bride. Self Respect Marriage brings together a boy and a girl of equal status. The fourth one is ‘Young friends, Do you know? Compilation of 200 Historical Facts’ an English booklet, consisting of statements, presented in the form of questions, which cover the history of the Self Respect Movement. It starts from 1899, when a handbill advertising a drama had the words, ‘No admission for Panchamars’, and asserts that it was Periyar’s Self Respect Movement that changed this evil practice. Item No. 64 records the fact that Omandur O.P Ramasami Reddiar, Congress Chief Minister of Madras, rejected the appointment of Thiruvenkatachariar as the Madras High Court judge, in spite of strong recommendation from Jawaharlal Nehru, but appointed N. Somasundaram, a Tamil. Item 147 records that when a Brahmin Nandakumar was sentenced to death when Warren Hastings was the Governor General, for swindling crores of Rupees, the Brahmins agitated against the sentence. This will prove a handy guide for youngsters, and even grownups who often complain of finding no time for reading. This work contains only capsules, which could be taken at the rate of two or three at a time. The work goes into the history of propagation of the idea, which implied decrying all the obnoxious, even obscene, traditions which had been introduced by the Manudharma and other Sastras which glorify inequality. The courts refused to understand the rationale behind the wedding and thoughtlessly annulled those few which came under the courts’ review for one reason or another. Yet, so firm was the conviction of Periyar’s followers that such weddings went on in scores for more than three generations, not only in this country but in Malaysia and Singapore too. In course of the discussion, the work refers to the horrible life widow’s in the country are forced to lead and brings out the need for widow marriages. This work is more a compilation than a narrative and is all the more interesting, all the more informative and all the more convincing. This reproduces extracts from stalwarts like Ma. Rajamanickanar, Maraimalai Adigal, Somasundara Bharathiar and Poet Bharathidasan. An appendix gives a detailed account of the first ever Self Respect wedding that took place at Suklanatham near Aruppukkottai in 1928. Three weddings were conducted at one stretch without any ritual like lighting the lamp or camphor. The weddings were conducted by Periyar, with a number of luminaries being present. Periyarism has started spreading beyond the boundaries of the South and there is a glimpse of one such wedding that took place in 2018. On the whole this book, written in a simple language and containing a variety of materials can easily be called a page-turner. All the interested in self respect ideology must go through this work which is an entertaining as informative.